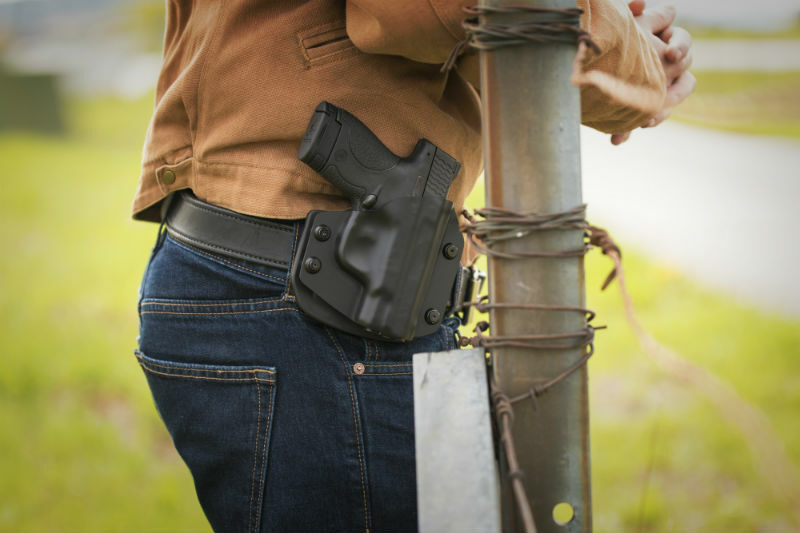 Do you use your gun belt as your normal every day belt even when not carrying? Who says you need a gun to wear a gun belt? The word “gun belt” would seem to indicate that is all it’s good for, but to be frank, you really don’t have to be packing to enjoy the perks of wearing a gun belt..
What is a gun belt for? Well, you wear one to hold up a gun. Standard belts from a department store don’t provide the requisite horizontal or vertical tension to secure a firearm. They also have to work as a regular belt while carrying. If interested we discussed the difference between a gun belt and a normal belt in great detail. In short, a gun belt is over-engineered compared to a department store belt. If you don’t wear a gun, it’s going to hold your pants up better than any belt you’ve ever had has. In that regard, it would make a gun belt a fantastic gift for someone with chronic plumber’s crack, even if they don’t carry or own a gun. But Will It Be Comfortable? 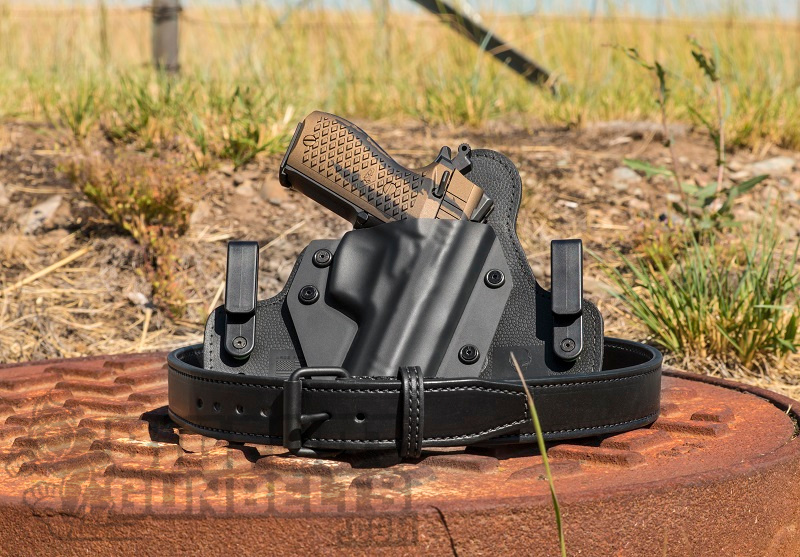 A gun belt, like any belt, will be perfectly comfortable if you don’t cinch it up too tightly. That’s just how belts work! Examine, for instance, the following Reddit addresses the same idea. Just about every comment says as much. If your gun belt is uncomfortably tight, you can loosen it. If it sits in an uncomfortable location, you can adjust it. Since it will hold much better than a standard belt, once you’ve found a good spot for it to sit on you, the belt won’t be going anywhere. A belt made for guns is just thicker and stronger than what you’ll find at a department store or wherever it is you shop for clothes. Just like a standard belt, there is a wide range in prices, construction and so forth. You have synthetic materials (such as nylon) and leather. You can go on Amazon.com right now and find a plethora of nylon gun belts, mostly marketed as being “tactical,” many with very reasonable price tags. A lot of cheap department store belts are nylon too; the tactical models are just built to hold more. In this regard, you can get a cheap belt that will last even longer. If interested we discussed the difference between leather gun belts vs nylon gun belts. Then you have leather. Leather goods, of course, range in quality; there is cheap hide that will go to pieces in a matter of months as well as leather goods that will last years despite a most modest price tag. However, if one is willing to purchase leather, it behooves one to know a bit; not all leather is created equal. 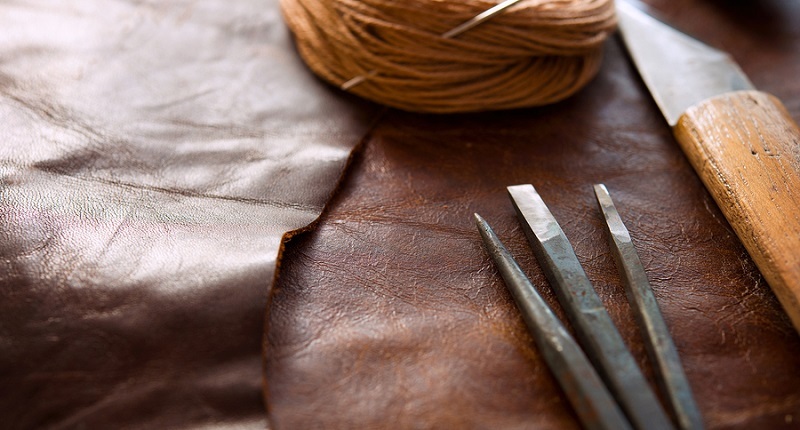 Leather is cured skin, and skin - as most of us remember from health classes - has two layers, the epidermis and dermis. Generally, the deeper you go, the softer, less uniform and less durable the material. Top-grain leather is the highest quality and highest strength. It’s made of mostly the top layer of hide (epidermis) with some of the bottom layer; often about a 70-30 mix, or somewhere thereabouts. Full-grain leather is closer to 50-50. It’s easier to create a uniform appearance, though full-grain leathers are not as suited to, say, work purposes. Top-grain leathers, thus, command higher prices. 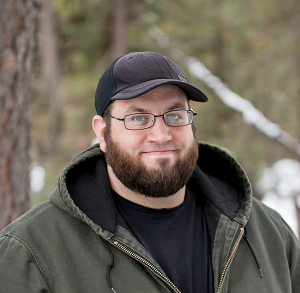 Not to toot one’s own horn, but Bigfoot gun belts are actually a bargain. It isn’t easy to find a handmade English bridle leather belt - which incidentally is top-grain - with this rugged of construction, and that looks as good, at the same price point. Bridle leather, yes, but not as solidly built. Why would anyone wear a gun belt instead of a regular belt if they weren’t carrying? Simple answer is that you can get a belt that will last you longer than what you’d typically get in a store. 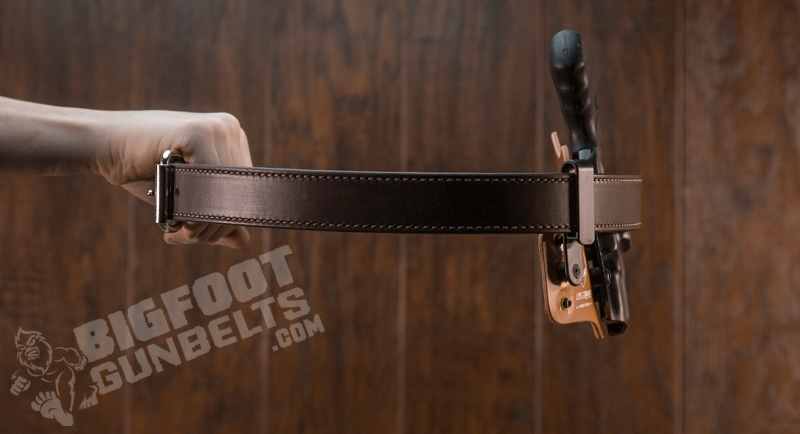 A leather gun belt may be the last belt you ever need buy. If you do, wearing it will be just as comfortable.